Westmin Resources Inc. (1980’s) uncovered an outcrop 1 km north of the Thor deposit that yielded 0.136 Oz/t gold in grab sampling. Taranis found a quartz boulder field in the same area in 2014 and sampled gold values of up to 1 g/t Au. This type of mineralization is diagnostic of the up-dip edge of the main Thor deposit that has yielded multi-ounce gold values over 1 km to the south, and is now thought to be the peripheral silica exhalative horizon to the main Thor sulphide deposit. Two gossans were found in 2014 by Taranis about 280 m east of these gold bearing samples, and can only be explained as having origin from weathering sulphides originating from the prospective Sharon Creek/Broadview Formation contact that is estimated to lie about 100 m below the surface. This is consistent with the interpretation that the gold-bearing zones found by Westmin transition into massive sulphides at depth typically seen at Thor in the True Fissure Mine area. The Ridge Target occurs on the east side of a prominent anticline that hosts all the mineralization at Thor, and dips under Thor’s Ridge where it is covered by the hanging-wall Broadview Formation. The currently known Thor deposit could only be the apex of a much larger spindle-shaped body that plunges to the north and extend under Thor’s Ridge. This may explain a zonation that was noted where gold and silver content increase northward over the currently known 2 km long deposit. 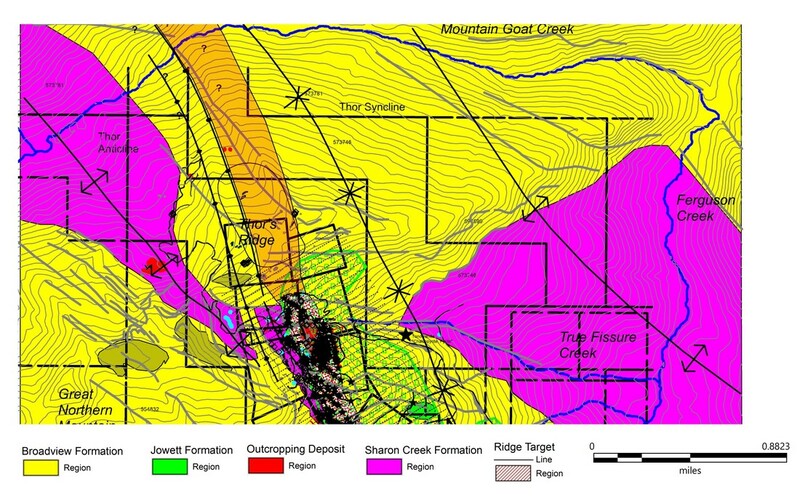 Shown below is a longitudinal that shows the location of the known zones at Thor (right side of image) and the Ridge Target shown in magenta on the left side of the image. The importance of this target is obvious - the current 1.5 km strike length of the Thor Deposit could be expanded considerably to the north. Several deep drill holes are planned on the north side of the 'Ridge' that will target this horizon. It is unknown how far the Target Horizon extends to the north of the current Thor deposits. (click on the map below for a larger image).